Chicago, IL – Aug 23, 2018 – This September, Feeding America and our nationwide network of food banks will mobilize across all 50 states in an effort to bring an end to hunger. Hunger Action Month™ is designed to inspire people to take action and raise awareness of the fact that 41 million Americans, including nearly 13 million children, are food insecure, according to the USDA. In the U.S, more than one in eight people struggle with hunger and may not know where they’ll find their next meal. That number includes one in six kids who may not have enough to eat. September marks the eleventh year, Feeding America and its network of 200 member food banks has organized this annual call to action. This year the campaign will focus on the strong connections between hunger and health. 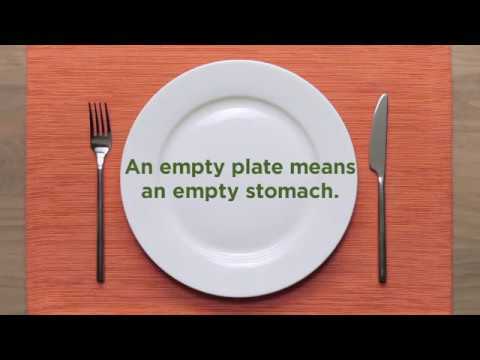 This year, on September 13th, Feeding America asks supporters to share what they couldn’t do without adequate nutrition by writing on an empty plate, “On an empty stomach I can’t ______,” and filling in the blank with something they couldn’t achieve without the nutrition we need to thrive. These photos can be posted to social media with #HungerActionMonth, @FeedingAmerica to join the conversation. To learn more about Feeding America and other ways you can get involved for Hunger Action Month, please visit HungerActionMonth.org. Feeding America is the nationwide network of 200 food banks that leads the fight against hunger in the United States. Together, we provide food to more than 46 million people through 60,000 food pantries and meal programs in communities across America. Feeding America also supports programs that improve food security among the people we serve; educates the public about the problem of hunger; and advocates for legislation that protects people from going hungry. Individuals, charities, businesses and government all have a role in ending hunger. Give. Volunteer. Advocate. Together we can solve hunger. Visit www.feedingamerica.org, find us on Facebook or follow us on Twitter. As Feeding America's workplace giving partner, America’s Charities can help your company design and implement a program centered on supporting their work - through workplace giving campaigns, employee fundraising, cause-focused signature programs, volunteerism, donation drives, matching gifts, Dollars-for-Doers, In-Kind Giving and other employee engagement and philanthropic initiatives. Click here to request a demo and learn how we can help you do this.